Here we select one of the paradigm-upsetting deselected facts about the Sepher Yetsira -- its central focus on duality and the unification of opposites, which of course makes sense for a treatise on the One Dual Energy. But the duality of the Sepher Yetsira, and its constant descriptions of the structuration of reality by energy in dual states, is never seen, and even less its unification in the One Name. The Game, or at least its perception, is usually over right here, when, in a book everyone says is about the alphabet, the aleph-bet is not seen in the third and fourth words of the text. The book itself, which reads like a kind of instruction manual, tells us explicity to understand, combine, permute, and invert, but its advice is never taken, it seems, and the whole theme of the reverse imprint of intemporal energy is missed. As if that weren't enough, in a book everyone says is about the alphabet, and which itself says to permute and combine, no one can see that "Spheres of Emptiness" is just Spheres of Elohim spelled with a B for an A and life (Hay) at the end of instead of the middle. Elohim is the energizing process of the Sephirot, as stated in the quality of the First Sephira Rouahh Elohim Hhaim  Belimah is the response of Bayt (container) to the Aleph/Elohim process. SY 1:2 Ten Sephirot Beli-Mah and twenty-two Autiot Yassod; three Mothers, seven doubles and twelve simples. Wondrous Paths, Spheres of Emptiness, Foundation Letters. Lost in sensual poetic imagery, both the inner meanings and the fact of the pairings of these words/equations is invisible. Twenty-two elements (Autiot, feminine plural) in a single body (Yassod, masculine singular). The Many and the One are united in a single pair. Summarizing: SY 1:1 By thirty-two intermediaries YHWY projects Schem with three Spheres, ten Sephirot Belimah and twenty-two Autiot-Yassod. So we arrive at our third double equation, Autiot-Yassod, so uselessly translated as "Foundation Letters," which is defined as the action of the alephbet itself, already prepared by the Aleph-Bet hidden in plain sight in Wondrous Paths and Sephirot Belimah. We are told that the thirty-two intermediaries as a group are reverse projections of the Aleph-Bet, and that the Sephirot are responses or containers (Bayt) for the infinite energy of Aleph and Elohim. Autiot-Yassod introduces the alphabet explicitly as a primary agent of creation, and the duality here is not between the uncontainable Aleph and its container Bayt, as in the first two pairs, but between Aleph and Yod, between intermittant life-death and duration and existence. The Autiot-Yassod are the Aleph-Bet in existence, singular and plural messengers in the process of creation. SY 2:6 With what is being projected is made everything that is formed (just as) the words (everything is) One Name and the proof of the saying: twenty-two elements in a single body. The Sepher Yetsira gives the equations or instructions for the stepping-down of infinite energy/consciousness and its progressive differentiation and structuration and eventual complete materialization at the Tenth Sephira. This process can be observed in the permutations of the First Four Sephirot, where the Autiot are engraved at the Second Sephira as the reverse imprints of the energy of One/Aleph/Keter, and then throughout the rest of the text as the One becomes two, and then three (Mothers/elements), seven (Doubles/planets) and twelve (Simples/signs). But the important thing to see, here at the beginning, is that instead of floating off into speculation about the "mystical" meaning of these "obscure" terms (let alone their supposed Biblical origins), the text itself is telling us exactly what they mean  that what we know as Creation is the result of two energies acting as one: infinite energy/consciousness (Aleph) and its physical supports (Bayt) (Paths and Spheres) , and the Intemporal (Aleph) and its manifestation in existence (Yod) (the Letters), to create the essense and semblance of all that is. From the point of view of the Sepher Yetsira, energy has two poles: Aleph/Infinite expansive energy and Tav/ infinite compressive energy, and flows between them in two directions; in an evolutionary direction moving from unstructured towards stuctured energies (Aleph to Tav), and in an involutionary direction, moving from structured energies/forms to more unstructured, unconditioned states (Tav to Aleph). We will see this theme elaborated in all the major structures of the Sepher Yetsira. SY 1:3 Ten Sephirot Belimah according to the number of ten fingers. Five opposite (or: as in the presence of) five. And (the) covenant (of) the One, adapted (or, directed) in the midst of (or, by means of) (the) word (of) the tongue and as (the) circumcision witnesses. The Elephant in the Room of Sepher Yetsira scholarship is its supersaturated dualism, which fits into neither a monothesistic or a rationalistic framework. The Sepher Yetsira is a compact, short (seven pages in Kaplan's Short translation) text; one has the feeling of being told only the essentials in a description of how energy gets from unity to muliplicity. How many times does the text tell us directly that energy has two directions and two poles? The first thing the Sepher Yetsira tells us, after the basic dual equations of 1:1-2, is that there is some kind of deal or "covenant" between unstated parties, and that this covenant is really two covenants  one of circumcision (flesh) and one of the tongue (word). The usually unasked questions are why are there two covenants, and why these two, the toes and fingers and circumcision and the tongue, and the flesh and the Word? One for Spirit and one for matter would seem to be too obvious and too ... dualistic. Because if there are two, and not just one, how are they related? If God didn't create all, or matter and evolution doesn't explain everthing, then what? We are largely unprepared for this question, which is how the covenants, or poles, of energy/consciousness could be possibily be related (outside of our monotheistic and materialistic/rationalistic/scientific frameworks). Fortunately, the Sepher Yetsira comes to our aid with its next dualistic statement. SY 1:6 Ten Sephirot Beli-Mah their apparition (or, aspect) as lightning (or the vision of lightning) their aim has no end. Its utterance with (or, in) them with its course and return and when its word (is) like the tempest they descend (go underneath) in front of the throne and "they" carouse. SY 1:8 Ten Sephirot Belimah. Shut (or, restrain) your mouth and do not speak (or, enclose the word) and your heart and do not think (or, let your heart enclose its thought) and if your heart begins to run, return to the place where it is said: lives run and come back, and on this word (the) covenant is made. Now this is sounding dangerously close to some kind of dualistic viewpoint, where (living) energy runs in two directions, from one infinite pole ("their aim has no end") to another. It's even more remarkable to say that this is the basis of the whole deal. It is not just that there is a beginning and an end, but there is an end in the beginning, and a beginning in the end. Which is what it would look like if energy/life were flowing from the beginning to the end, and from the end to the beginning at the same time. Again, dangerously dualistic, but we are left with a description of "lives" or living energy, flowing through the Ten Sephirot (from Beginning to End) in two directions. SY 1:13 Five: three Autiot among the simples. Sealed (the) height (or apex). Three chosen. Solidified them with his great Name: Yod-Hay-Waw. And sealed with six extremities. Turned towards the upper, sealed it with Yod-Hay-Waw. Often with the Sepher Yetsira, the truth is out in plain sight, as we have seen. If the reverse imprint of the Aleph-Bayt is recognized in Nativot-Playiot, then the meaning of the Seals as used by the text, should be clear. The primary meaning of "seal," rather than the secondary meaning, "close off," is an impression in wax  the "royal seal," for instance, which is a reverse impression of the object or energy making the seal. For more on this theme, see the Sepher Yetsira's favorite verb of creation, Hhaqaq, (engraved), and Hhatsavan (carved). SY 2:1: Twenty-two Autiot Yassod. Three Amot (Mothers) seven doubles and twelve simples. Three Mothers: Aleph-Mem -Sheen. Yassodan (based on) Kaf Zakot-We-Kaf Hhovah. And Lischon, the tongue Hhaq Merkaryi between the two. In general terms, the Sepher Yetsira tells us how energy/consciousness gets from One (the First Sephira) to Ten (the Tenth Sephira) (and back again). Note that the Sephirot are only named by number; Keter through Malkut will come much later in medieval Kabbalah. When named by number, the first is Aleph/Ehhad and the tenth is Yod/Esser. The Sephirot One to Ten are the structure by which the Infinite/Aleph/1 enters into existence  the finite/Yod/10. "The Infinite is satisfied in the numbers." The first chapter of the Sepher Yetsira is concerned with the ten Sephirot-Belimah, in general and individually, with the Autiot of the Hebrew alphabet playing only an intermediary role. The rest of the book (before the short concluding Chapter 6) is concerned with the twenty-two Autiot-Yassod organized into three groups: three Mother, seven Double and twelve Simple letters. The discussion of the individual letters begins in Chapter Two, with the Three Mothers. We have seen that Chapter One is full of duality in its dual equations and covenants and double flows and reverse-impression seals. Chapter 2 begins by telling us how the three is based on the two  as a mediation between (a hollow of) fullness and (a hollow of) emptiness. However we construe these terms (acquittal/guilt, credit/debit, and their scales and pans in the translations) there are two of them, and the general idea is a polarity of solid/full and hollow/empty, or plus and minus. [ But what do these terms mean? Normalizing scholars, desperate for Biblical ideas, want to base some kind of morality on these "guilts" and "acquitals," and "scales," but we really don't have a Garden of Eden situation here, and moral projections don't make much sense in the context of the early differentiation of the Three Mothers. If a projection is necessary, thermodynamics would make a better belief system, and we could think in terms of equilibrium states (credit, debit, more or less) being estabilished between maximum (Sheen) and minumum (Mem) states of the one energy. If we don't need projections, we can notice both the similarity and the complementarity of these equation-pairs. In the first column, we start with either the undetermined (7/Zayn) or the indefinite (8/Hhayt). In the second column, a container is provided, either in existence (20/Kaf, physical supports) or as an archetype of form (2/Bayt). The third column is identical Vavs, proliferating in physical existence (400/Tav) or life itself (5/Hay). The indefinite provides possibilities for life but is not in existence (no multiples of ten); the undetermined ranges from 7 through 20 to 400, as it acquires the physical structures necessary for the realization of those indefinite possibilites for life in actual existence. 2:2 Twenty-two foundation letters: They are set in the Cycle in 231 Gates. The cycle oscillates back and forth. It seems that things are going in two directions again. These verses, after the introduction of the Three Mothers in 2:1, deal with the Autiot as a group: twenty-two objects in a single body, and their relationships with each other. The initial permutations are each letter with every other letter, in two directions  an evolutionary/building up (Aleph to Tav) of structures and an involutionary/dissolution (Tav to Aleph) of structures direction. As if course and return and lives run and return weren't enough, we now have back and forth cycles and oscillations. SY 2:4 Twenty-two Autiot-Yassod fastened Belgalgal (to a turning wheel) by two hundred and thirty-one Schaarim (portals, values or measures) and the wheel turns forwards and backwards. It is a token of the language. Nothing in Tov is superior to Aanag (pleasure or coitus) and nothing in Raa is inferior to Nagaa (plague or leprosy). Nothing feels good like homeostasis and we are plagued by change and uncertainty. The two oscillating directions of back and forth are both constructive (Aanag) and destructive (Nagaa), and no stabilty (Tov) is better and no uncertainty (Raa) is worse. The mirror-imaging of these words is obvious and their reversal of direction should be too. SY 2:5 (This is) how Aleph (is) weighed, combined with everything, everything with Aleph; Bayt with everything, everything with Bayt. There are reasons why a text that tells us explicitly, "a spiritual component with everything, everything with a spiritual component; a physical component with everything, everything with a physical component" would not be understood. We're sure you can think of them. This explicit statement is usually submerged and lost in the proliferation of further combinations: Ghimel with everything, etc. (12 of 19 early recensions do this in an additional verse, Hayman �21, with the Long Version, Ms A extending to Ghimel in the base verse �19, see Hayman 2004). We have already been alerted to the theme of Aleph-Bayt, through its visible imprint on Chapter 1's Nativot-Phayliot and Sephirot Belimah, and the centrality of the Autiot-Yassod, which is the Aleph-Bayt in existence (Yod). We might be led to think that there is something special about these particular permutations (2 out of 231), beyond just place markers for the start of the alphabet and abbreviations for the rest. At this point in the text, at the first time it is able, because the individual letters of the Autiot-Yassod hadn't been discussed yet, in a book thought to be about the alphabet, we are told: Aleph-Bayt with everything and everything with Aleph-Bayt. A spiritual and a material component with everything and everything has both a material and spiritual component. The Sepher Yetsira never wastes words, even when it appears to be economizing, and we are at the core (once again) of the Sepher Yetsira's duality. SY 3:2 Three Mothers: Aleph Mem Sheen Sod Gadol, Mev Phaylay Vemakossa sealed by six seals (or hall marks) and from them are derived Fire, Waters divided (into) male and female. Three Mothers: Aleph Mem Sheen, Yassodan and from them the Fathers, the creators of everything, are born. In Chapter 2, the Three Mothers are introduced in the first verse and then the text focuses on the "permuations and transformations" of the Autiot as the foundation for the soul of all that was formed and all that will be formed in the future. Chapter 3 returns to the Three Mothers as the basis for the expansion and further structuration/formation of the One Dual Energy and begins by repeating 2:1. In doing so, it does two things: it leaves off the "Twenty-two foundation letters ..." because it is focusing on the Three, and it reverses* merit and liability. 2:1 [�23] Twenty-two foundation letters: three Mothers, seven Doubles, and twelve Elementals. The three Mothers, AMSh, their foundation is the pan of merit, the pan of liability, and the tongue of decree deciding between them. 3:1 [�23] Three Mothers, AMSh: Their foundation is the pan of liability, the pan of merit, and the tongue of decree deciding between them. * Hayman's �23 recensions and later editions like the GRA revision don't reverse the "scales," but both Kaplan's Short (doesn't specify exact source) and Suares' version ("multiple sources, all unreliable") do. It is easy overlook subtle or minor variations in the text as scribal errors or editoral preferences, particularly when they don't seem to mean anything in a text that isn't thought to mean anything to begin with. Why reverse merit and liability? Because the text is signaling a change from an external viewpoint (where things appear as solid, full) to an internal viewpoint (where they are actually hollow, empty: think atoms). The pattern of reversals present in the text would support its usage here. There are really two secrets in the four words that follow Aleph-Mem-Sheen. The first secret is that the secret of Sod is in the word itself. The second secret is in the word that describes the first secret, Playlay, "mystical" or "marvel." One would have thought that in a book thought to be about the alphabet ... more attention would be paid to the letters themselves, especially when the particular letters are about the alphabet itself. If we do pay attention to the letters themselves, we have to wonder if the secret "Sod" is in any way related to one of the text's favorite equation-pairs Autiot-Yassod, with which it shares three of four letters, and the root, Sammekh-Waw-Dallet. Sod, "secret" is Yassod without the Yod of existence. The "secret" of Aleph-Mem-Sheen is in the name Sod, which precisely defines its secret as based in a pre-existent state of the alphabet itself. The single-body aspect (Yassod) of the Autiot (twenty-two elements), before it gains the existential Yod and brings the alphabet itself, the primary instrument of creation, into existence, is the "secret" basis for the self-engendering operation of the Three Mothers. This secret of the pre-existing Sod is immediately qualified by Mev Phaylay, and since we are paying attention to the letters, we have to wonder if the term is related to another of the text's favorite equation-pairs, Nativot-Phayiot, which contains all its letters, in order, and just happens to spell half the alpha-bet. If we don't get lost in wondrous paths and mystical secrets, we can recognize the two usages of the reverse Aleph for what they are  operations having to do with the early stages of formation (Nativot-Phayliot) and the roots of the Three Mothers (Sod Gadol), where what is being formed is the reverse impression of the energy doing the forming (engraving, carving, sealing). The secret of the pre-existent alphabet, and the secret of the Three Mothers, is in the realm of the reversed Aleph. After revealing the Great Secret of the pre-existing reverse alphabet underlying the formation/differentiation of the Three Mothers (and the Thirty-two Paths) the text explains that further development will be based on the polarity, or duality, of fire and water, or male and female. The text will leverage this duality to further differentiate the Three Mothers into the polarities of the Six Seals, and the generation of the Fathers and the Elements. So once again, duality is employed in service of further structuration/formation. Vemakossa is usually translated as "concealed" (Kaplan) or "hidden" (Hayman) so we get "secret great mystical concealed / ineffable hidden" which is a lot of adjectives for the Sepher Yetsira, which is usually more terse. Like the words preceding it, Vemakossa is about the alphabet, and the underlying ("covered") energies necessary, in this case, for differentiation via male and female genders. Spelled Waw-Mem-Kaf-Waw-Sammekh-Hay we find the sexual conjunction of male (Waw) and female (Sammekh) energies/signifiers alive (Hay). The text introduces male and female as pre-existing letters in its alphabet of formation, in this case just as it gets ready to form the duality of male and female as a means of multiplying the Three. 3:5 [�31] Three Mothers, AMSh: Engrave them, carve them, permute them, and with them seal three Mothers in the Universe, three Mothers in the Year, and three Mothers in the Soul, male and female. 3:6 [�32] Make Aleph king over breath, bind a crown to it, and combine one with another. And with them seal air in the Universe, the temperate in the year, and the chest in the Soul, the male with AMSh, and the female with AShM. We have seen how the two in the one become three. Now, the three become seven as the Sepher Yetsira expands its description of the structure of creation/formation into the outer directions of the Cube of Space and the lower six Sephirot, and the inner, hidden dimension that "supports them all." The first group, which forms Adam Qadmon's inner, timeless, life is characterized non-spatially as the pairs or oppositions of Beginning/End and Good/Evil (stable/unstable). The second group is the six spatial directions of Adam Qadmon's outer, developmental, experience and their psychological correlatives. The first group is described before the Three Mothers have engendered themselves and the Fathers in the Three Spheres of B'Olam, B'Shinah and B'Nefesh, or existence, life, and experience. The second group can only be fully characterized after the Three Mothers because they manifest in the Spheres of Universe, Change and Soul with the various qualities of outer experience. Note that the Sepher Yetsira specifies the first four Sephirot and the outer six Directions; it leaves it up to the reader to find the location of the Seventh Direction. We've gotten to the point where it is pointless to continue without finally invoking the central fact of the Sepher Yetsira  that it constructs a Cube of Space. The Three Mothers form the inner axes of the Cube, and the planets and signs form the outer faces and edges (in the Sphere B'Oolam). The Seals of the Name in 1:13 reappear in the Seals of the Three Mothers in Chapter 3, differentiated into male and female pairs and opposing faces of the Cube. Each of the Three Mothers has its own duality. How does the Three become Seven? By becoming Six and crossing at the Center. It should be clear by now that the Sepher Yetsria, and the Cube of Space that it forms, is a single semantic object or unity. All levels of the text: Sephirot, Seals, Axis, Direction, Formative, Planet and now Contrary Quality, are all part of the "One Name," and their specifications are all logically, not "mystically," related and integrated. It should also be clear that duality leaves its stamp on every level. On the level of the Seven Double letters, the stamp of duality could not be clearer. The Hebew alphabet just happens to have seven letters which called "double" because they have two pronunciations, according to whether the consonant is hard or soft, with a point or without, and whether the energy is resisted or accepted. In the Cube of Space the Seven Doubles (contraries, or seven pairs of opposites) occupy the faces and center and thus represent energies that pass through us. We perceive these one-way flows as dual according to our orientation to them. More pairs of opposites, this time describing an acceptance of or resistance to energy, as the basis of the doubleness of the letters, which have a different duality, or contrary quality, in each of the Seven Doubles. We have seen how the Three Mothers double themselves in partnership with each other (Aleph-Mem-Sheen, Aleph-Sheen-Mem), and seal the Six Extremities and the poles of the axes of the Cube. Before we even get to the Contrary Qualities, there is another duality module to be recognized in the linked oppositions of the poles themselves: Up-Down, Ahead-Behind, Left-Right. Each of these axes are formed, as we have seen, by a different Mother letter (in cooperation with the other two), and are differentiated into male and female in Chapter 3 (see above). In the Sepher Yetsira, even the dualities have dualities. The fact that human experience is permeated with duality and conflict has not been satisfactorily explained by our non-dualistic religious and scientific frameworks. In Chapters 4 and 5 (Double and Simple letters) the Sepher Yetsira is obviously dealing with the outer experience of life, through the planets and signs, days and months, openings and organs, all the way down to the guts of the matter with Qof forming Korkeban B'Nefesh. This experience is completely framed in dual terms. In terms of our single semantic object, the question to be asked, for instance, is why 2/Bayt forms Shabatai/Saturn at the Fifth Sephira with the seal YHW on the axis of Aleph at the Depth of Above and Direction of Upper with the contrary qualities of Alive and Dead in the zodical homes of Ghedi/Capricorn and Deli/Aquarius. And then, perhaps, why Peace and Uncertainty are at the opposite pole from Hhaim-Mot. (Answers below). All these categories and levels of description are logically, not "mystically" or "magically" related. While the Mother letters and the axes flow in one direction (for instance, from Aleph-Mem-Sheen to Aleph-Sheen-Mem, the Contrary Qualities are either a "hardening" or a "softening," an acceptance or a rejection, of the particular energy of the planet/formative letter at either end, and reflect basic categories and qualities (Qualia) of human experience. How does the Seven become Twelve? Five become ten and two remain completely at home in their dwellings. More down-to-earth qualia. The energy that started at the First Sephira has established a Cube of Psychological Space and human experience, and has spread out through the twelve signs of the zodiac and edges of the Cube, to the "endless arms of the world." Another uncomfortable fact about the Sepher Yetsira is how deeply imbedded it is in astrological thought and language. The "mysticism" is bad enough and then half of the book is about astrology. This is a conumdrum for the scholars of Jewish Mysticism who are already burdened with one system of "mysticism" they don't understand (because it isn't mystical), let alone a second which is well-known for being irrational nonsense and which has no scholars at all. Here we have the flat, non-perspectival view of the zodiac and its expansion into the three-dimensional Cube of Space formed by the Sepher Yetsira. The Sepher Yetsira does not place the planets in the zodiac, but classical astrology does (which is why it is helpful to know a little of the language being used) and the rulerships of the zodiac in diurnal and nocturnal signs used to be common (assumed) knowledge. This is the same reason the earliest Short version doesn't feel the need to remind the reader of the classical order of the seven planets and lists only contrary qualities for the seven doubles (see Note 1). For our limited purpose of understanding how the Seven become Twelve, the astrology we need to know is that energy runs in both directions (of course) around the circular zodiac  in an evolutionary (building up of physical structures) and an involutionary (deconditioning of psychological structures) direction and that the impersonal energies of the planets have active zodiacal environments (their "rulerships") where their pointed or unpointed energies ("diurnal and nocturnal" signs) are natively reflected or reinforced (their "homes" or "dwellings"). And that two of the seven planets, the Moon and the Sun, psychological and physical energy (wouldn't you know it) have their Contrary Qualities in the same dwelling, Sartan/Cancer and Arieh/Leo (coincidentally formed by Hhayt and Tayt, unstructured and structured energy). Five of the Seven Doubles are in dual environments; two are dual in one. SY 6:1-4 One is above three, three above seven, seven above twelve, and all comunicate with one another. We have seen how this is true as the Sepher Yetsira explains how the One becomes many in completely logical and rational terms with no God said's, magical incantations, or mystifying verbiage  just constant descriptions of energy/consciousness in dual states of organization moving in two directions lives run and return self-generating successively from the One, Three, Seven and Twelve. ... And concluded with a covenant between the ten toes of the feet, and it is the covenant of circumcision, and between the ten fingers of the hands, and it is the covenant of the tongue, and attached to his tongue the twenty-two Autiot, and revealed Yassodan (their foundation) and sunk them in water, singed them by Fire, shook them by blowing, consumed them by the Seven and guided them by twelve constellations. The first thing the Sepher Yetsira mentions after the schematic or wiring diagram of 1:1-2 is the dual covenant of the One in 1:3. The last thing it returns to in its concluding verse is this two-covenants-in-one of circumcision and the tongue, flesh and the Word. In answer to the question of what is the Sepher Yetsira about, it seems to be providing its own answer: "It's about the covenants  two covenants with One dual energy." Note that these covenants, whatever they are, are not said to made with God, but between, if anything, the "ten toes ... and the ten fingers." In fact, God Himself, in any kind of Biblical sense, is strangely absent from the Sepher Yetsira, putting in appearances in several extending strings of god-names without any of the usual created, breathed, divided, said, saw and smited we are used to God doing. The text itself can be read in the present tense so it's not exactly an historical account. In several places, in fact, it seems to be speaking directly to the reader: Examine them. Delve into them and experiment with them and overall reads more like a lab manual or equation-set/logic diagram than anything else. But the important thing to see is that the covenants are equal. There is no secondary, lesser, power in the Sepher Yetsira's description of creation/formation. What there is, is unification in the One Name. The Covenant is dual, but the Name is One. We have focused on the evolutionary path of energy/consciousness from Unity (1/Aleph/Keter) to Multiplicity (10/Yod/Malkut), constructed through Thirty-two Paths, Ten Sephirot, Three Spheres, and the intermediaries of the Three Mother, Seven Double and Twelve Simple Hebrew Autiot, acting multiply and singly, and have found dual structures (Aleph-Bayt) and opposites directions (Bayt-Aleph) operating at every level. Without seeing the duality in the Sepher Yetsira, it is impossible to see the unification. What is the Sepher Yetsira about? It tells us: the Dual Covenant and the One Name, or duality and unification. Before turning to the parallel theme of unification, which was there at every step but had to be ignored in order to focus on one unseen thing at a time, we can pause and consider what we may have learned. First, we have to seriously entertain that we are not speaking the same languge as the Sepher Yetsira, in translation or in Hebrew, and approach the text as if it were written in code with a conceptual framework (the integration of dual energies/states of consciousness) that is completely unfamiliar to us. Second, there is no mysticism in the book, which develops its structures logically from basic propositions and postulates. Third, the work is an integrated plan, or single semantic unity with multiple integrated levels of description and expansion. Fourth, it constructs a cube of psychological and experiential space which seems to be using a technology more advanced than our own (see Metapsychology) let alone the ancient world (which lacked 3-D perspective and subjectivity, for instance). Fifth and related: it has a view of creation and the man's place in the universe which is completely anomalous not only within Judaism but World culture. Understand with Wisdom, and be wise with Understanding. Examine with them and probe them, make a thing stand on its essence, and make the Creator sit on his base. Sounds just like the Bible, doesn't it? We are getting to the heart of several problems at once. If we admit that if the Sepher Yetsira were going to be understood in its idiomatic Hebrew and conventional, colloquial translations, it would have been by now. In fact, the scholars seem unable to place it in any of the conventional traditions of Kabbalah, though they can trace its influence on later texts like the Bahir. Then, if we deny the other escape, that it is somehow a "mystical" text (whatever that means), what else is there? If the text falls into neither normative Judiasm or the scholarly study of mystical texts, but is in fact more like a recipe book, are we going to criticize the text and look for Biblical parallels and normative assimilations, or are we going to actually follow the instructions, and see what the recipe produces? Which is, of course the advice of the book itself. The conceptual framework that we don't have, but which we need, to understand the Sepher Yetsira, is its integrated dual framework, which seems to lie both inside and outside of Monotheistic Judaism and Scientific Materialism. One reason why dualism has traditionally been unpopular is that it doesn't explain exactly how the Two are related, or why there need to be two, rather than either One, which are quite happy to do without one another. And when Abraham our father gazed, he looked, saw, delved, understood, engraved, carved, permuted and depicted, and he was successful. Seventh, God's role in the text is unusual and ambiguous. And the Master of all, Blessed be He, revealed Himself to him, and took him in His bosom, [kissed him on the head, and called him, "my Beloved"]. Abraham followed the instructions and succeeded and the Master of the Universe/Knower of All loved him for it. Finally, in the last verse of the book, we have the only explicit Biblical reference in the Sepher Yetsira and it's not even to a Jew. That's how Biblical it is. 5:4 [�56] These are the twenty-two letters which are founded by the Blessed Holy One [Yah, YHVH of Hosts, God of Israel, the Living God, high and exalted] dwelling in eternity, whose name is Holy, exalted and Holy is He. And in the Breath of God in 1:9 and 1:14 (One: Rouahh Elohim Hhaim) and the permutations of the Seals (Turned towards the upper, sealed it with Yod-Hay-Waw) of YHWH in 1:13. All these examples seem more like functional formulae than the actions of a Deity (note the "turned" and "sealed" are not said to have been done by God or anyone else). The closest the text gets to invoking a divine figure is in four (two back-to-back) references in the first and last chapters to a "faithful King" or "singular Master." 1:5 The singular Master, God faithful King, dominates them all from His holy dwelling until eternity of eternities. 1:7 For the Master is singular, He has no second. And before One, what do you count? 6:3 And God (EL), the faithful King dominates them all. The "God"s in Kaplan's translation are slight exaggerations. Hayman has "unique Lord trustworthy divine king" and Suares "Adon Yahhid true King (or eternal)." The references to singular master or unique Lord overlap with the Sepher Yetsira's last and most important category of divinity, the One Name. 1:9 [�10] One is the Breath of the Living God, blessed and benedicted be the Name of the Life of worlds. 2:5 [�19b] They repeat in a cycle. Therefore, everything formed and everything spoken emanates in one name. And that's pretty much it for God in the Sepher Yetsira. It's almost as if the text were trying not to make a monotheistic Deity the focus of attention. The book is not really written from God's perspective, either, who can't turn His back on his creation and probably doesn't have intestines. The ghost in the machine of the Sepher Yetsira is, of course, Adam Qadmon, whose life is formed by the Cube of Space, which is a good reason not to see it, or understand its centrality and implications, in the first place. The Jews have a long history with Ha Shem, The Name, the Name you are supposed to say instead of the actual Name (Elohim, YHWH, Adonai, El, Shaddai) out of reverence for its holiness when not in a liturgical setting. YHWH is normatively (WP) considered the proper name of the G-d of Israel, while the others (Elohim ...) are seen as titles or attributes of G-d (opinions vary, see AHYH). So Ha-Shem, The Name, is the most generalized and least specific Name of God. Beyond the traditional unsayable names are even more unsayable names like the Name in 42 and 72 Letters. Suares finds both structures in the First Verse of the Sepher Yetsira. Ultimately, every letter of the Torah is a name of God, according to the Rabbis. The Name itself must be understood in the language that the Sepher Yetsira is using, not in our colloquial translations and idiomatic Hebrew, especially because it lies at the heart of the text. The language that the Sepher Yetsira is using, which is not the language of our translations and our Hebrew, otherwise we would have understood it already, is obviously the language of the Book of Formation  a "formative" language dealing with how the One energy becomes Three, then Seven, then Twelve, and steps itself down through the Ten Sephirot to become Many. And returns to the One, of course. Let's frame the problem of meaning in the Sepher Yetsira more clearly. We see that the Sepher Yetsira is based on the experimental method and its understanding requires following the instructions, rather than analogies to Biblical verses and the understanding of authorities. So, without using the method the book explicitly says to use to understand it, the obvious conclusion to reach is that the book has no meaning. In the Sefer Yetzira system, grammar rules the world without its being used in any semantic manner ... This is a system in which the semantic level of language has been completely marginalized, viewed as a secondary, relatively insignificant use of a universal scientific set of laws. And if you think like that, you're stuck with the conclusion. What would an "alternative system" of meaningless signs look like? But even worse, we have a fracture in the divine, between a rational and an irrational component, where some things make sense and some don't, and the use of universal laws in the creation of the universe is meaningless and "relatively insignificant." Question: why destroy language and combine it in new ways? Why has this practice been used by so many mystics? What is the logic? Answer: why assume you understand the language you think is being destroyed? Not so many "mystics" seem to have really understood the non-mystical Sepher Yetsira (including Abulafia, whose permutations of the Name are not what the SY is talking about). And the text is, after all, one logical unit. In its own language, of course. We can see the dimensions of the problem. One is that we are only allowed to "observe and analyze" in certain areas. Because Idel can't see any meaning in the Sepher Yetsira, he is left with a "secondary" system of "letter combinations." which is like a dictionary with no definitions, or the Sepher Yetsira with all the meaning removed. It seems that the better question to ask is where isn't there meaning? In terms of "what is the text about?" the most-used verbs of the Sepher Yetsira are engrave, carve, seal, weigh, permute, transform, transpose, combine, formed, faced, spoken, emanates, make, created, bind and depict (translations from Kaplan) and are all used mulitple times, with engrave the most frequent, and make it clear that the so-called "Book of Formation" is actually not about "letter combinations," but rather the processes involved with the creation and especially the formation of the sensible and insensible worlds. Even without knowing the language it is written in. If we did know the language it was written in, even a little bit, what would it look like? We can return to our question of why 2/Bayt forms Shabatai alive and dead, etc., as an example of the Sepher Yetsira's integrated layers of multiple specifications. One might think that the mere existence of the Cube of Space within the Sephira Yetsira might be proof enough of semantic content in the text, even if one didn't know how the component elements of the structure are related. The Fifth Sephira is first qualified by its direction, Depth of Above, the first of the six outer/lower Sephirot. In its expansion through the Three, Seven and Twelve, the text will add these additional specifications  subjective direction, trigrammaton seal, axis and Mother-letter seal, planet and planetary binomial, contrary quality, and to anyone who knows a little astrology, nocturnal and dirurnal (pointed and unpointed) sign. That makes a respectable number of independent variables, or layers of potential semantic content, which need to be solved and integrated in the partial equation of the One Name that is specified by the Fifth of the Ten Sephirot Belimah. How much of the "formative" language that the Book of Formation is using do we need to know to begin to make sense of this? This is a good time to realize, as the Sepher Yetsira is fond of reminding us, that if there were such a thing as a "formative language," the formative words would have to be formed from formative letters, which themselves are formed from their spellings and the further spelling of their formatives, etc. Just to make the requirements for a logical system about as hard as possible. the First Four (inner) Sephirot have already been specified, and the Sepher Yetsira is describing the beginning of the formation of what we can only call (Adam Qadmon's) outer life or experience, which will manifest in the Three Spheres of universe, time and soul, or existence, life and experience. It wants to build an outer life capable of developmental experience. How does it start? At the Fifth Sephirot of Life. What is the first thing life needs to exist? Existence itself, provided by the axis of Aleph. Ok, well, then what's the second thing? A body. How do we bring the body into existence? With the Seal of YHW on the axis of Yod, Aleph-in-existence. (Twice, once for the inside and once for the outside.) Why is Up the first spatial direction? Why do you think? (Note the double specification of objective [Height] and subjective [Upper] directions). How do we make a body for physical/objective and spiritual/subjective life in existence? With Shabatai. What are the primary logical distinguishing characteristics of a body? Dead or alive. (Note the reappearance of Rouahh Elohim Hhaim from the First Sephira.) So what's the opposite of a body? Its inner movement. At the Fifth Sephirot (or stage of the descent or stepping-down of infinite energy/conciousness) of Life (Hay), on the axis of existence (Yod) a container (Bayt) for life-in-existence is formed in the Depths of Above and sealed with the two lives of YHW (the Fifth is the only double-sealed Sephirot), once for the inner life of the first four Sephirot and once for the outer life of the last six, by Shabatai (Sheen-Bayt-Tav-Yod, note the Bayt/Body and Yod/Existence and their location between and after Sheen-Tav), with the two contrary qualities (the energy is either allowed or disallowed) of Life and Death, or construction and destruction or anabolic and catabolic processes involved in the metabolism of the life of the body. There seems to be a theme here involving life, body and existence as primary categories, and it looks like we can get pretty far knowing only that Aleph is the uncontainable, that Bayt is its house or container, that Hay is life and that Aleph in existence is Yod. Add in Waw=connnection/union and Sheen=Rouah Elohim and Tav=Aleph's cosmic tablernacle, and the inner movement of Ghimel, and you might begin to be in a position to judge for yourself if there is any semantic content in the multiple specifications of Fifth Sephira of the Sepher Yetsira. The complete formative alphabet in twenty-two Autiot Yassod. The last thing to see, before we turn to the work of unification, is that the fear of random and meaningless "letter combinations" (which no one in their right mind would do) is not founded in reality. The Sepher Yetsira is simply telling us how to read the book of our own formation. It leaves it to the reader to put the formator on his base. The difference between the duality of the Sepher Yetsira, and every other system of dualism, is that it shows precisely how the dual energies are related and unified at every level of stucturation. We have seen how the text leverages duality to move logically from the One through the Three, Seven and Twelve to the Ten and the multiplicity of existence. We can now focus on the complementary theme to duality in the Sepher Yetisra  its unification at every level of description. Having completed its description of the expansion and structuration of the One, starting with Rouahh Elohim Hhaim at the First Sephirot, and ending with the complete specification of archetypal man's inner and outer life, down to the organ level, at the Tenth, the text tells us how they are all organized into one. Hayman's manuscript K betrays the Sepher Yetsira's fondness for reversed directions and gives us the Twelve below Seven below Three below the Abode of the One. But whatever the direction, they all "depend," are "bound one to another" and "communicate with one another" and are unified by a faithful and unique king  for his is one and his name one. Whatever these words mean, the text could not be more clear that it is describing a single (semantic) unity. SY 5:4 Here are (the) twentry-two Autiot, (as measured by) YAH, YHWH Tsebaoth Elohim Hhaim Elohi Israel, Exalted, On High, his eternal dwelling, holy (is) to him. This is the end of Chapter 5, and is the end of the Sepher Yetsira, as far as its desciption of the expansion of the One energy into multiplicity goes. Chapter 6 will add a little material (6:1-3) that didn't fit into the previous chapters and a concluding summary verse (6:4) introducing Abraham as a surrogate for Adam Qadmon (in case anyone missed the point) and reiterating the core theme of the two covenants. In the last verse of the core text, the Sepher Yetsira summarizes These are the twenty-two letters that have been its primary subject. 5:4, the end, is a condensed mirror of 1:1, the beginning, without the Paths, Spheres and Sephirot, and a slightly more concise list of names of God. (These are the only times the list is invoked). But with the order reversed. In 1:1, (wisdom engraves) Names of God create with ... and twenty-two Autiot-Yassod. In 5:4, the twenty-two letters which are founded by Names of God. Which is about what we would expect from a text that tells us their end is fixed (or, inserted) at the beginning, their beginning at their end, let alone one which is always reversing directions on us. These are the twenty-two letters that we have always assumed that we understood, despite their being called "foundation" or formative letters, and being used to somehow create and form man and the universe. It would be too much to imagine that these "letters" might actually mean something in themselves, and be part of a "language of formation" used by the Book of Formation, if it had any meaning, that is. At this, summary, level of the text, the twenty-two are not broken down into Three, Seven and Twelve, but are treated as a group (twenty-two elements in a single body) used to "found" or "measure" (the universe) and are the primary action, or the equivalent of [Names of God]. 2:5 and 2:6 contain a double overlapping unification: the twenty-two elements in a single body and the One Name. The Autiot of the Sepher Yetsira (contained within the Hebrew alphabet as inner meanings) was defined as both singular and plural (and male and female) at the beginning, in the Autiot-Yassod of 1:1. After dealing with the Sephirot in chapter 1, the text turns its attention to its primary subject, the Autiot, and Chapter 2 begins by introducing the Three Mothers, and showing how the Autiot relate individually and as a group. In subsequent Chapters, the text will expand through the Three, Seven and Twelve. Here, it gives us an explicit definition of Autiot-Yassod as twenty-two elements in a single body. We have seen that imagining that the Sepher Yetsira is meaningless is a major impediment to understanding its structure as a single semantic unity. But why would a meaningless text keep insisting on its singular meaning? If we accept the premise, everything that follows (through the Three, Seven and Twelve) will have to be related as one body, and part of one singular meaning. (19b) The result is that all creation and all speech go out by one name. SY 2:5 How? Weigh them and transpose them, Aleph with each one, and each one with Aleph; Bet with each one, and each one with Bet. They repeat in a cycle. Therefore, everything formed and everything spoken emanates in one name. SY 2:5 (This is) how Aleph (is) weighed, combined with everything and everything with Aleph. Bayt with everything and everything with Bayt. They return in a circular movement (turn by turn) to where all that is formed and uttered is found coming out of the One Name. 2:5 gives us the initial explosive expansion of the Autiot into the 231 Gates of every letter with every other letter, rotating in both directions, and is probably one source of the myth of "random permutations" (along with the "stones" of 4:12). More than half of the early recensions of the Sepher Yetsira expand the permutations beyond Aleph-Bayt (Hayman's �21), and the array of all the Gates looks pretty meaningless, except as an initial (two-at-a-time) list of semantic primitives being generated by the Autiot. 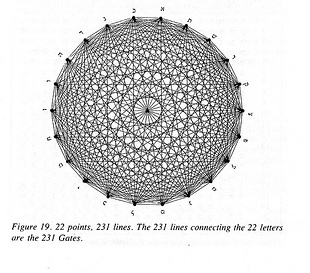 The next "cycle" of combinations would be the 1540 Gates of twenty-two taken three at a time, for 9240 permutations. This set of permutations can be expanded up to the full twenty-two letters twenty-two at a time for 1.124 x 1021 possbilities (see Kaplan, p.192). The intent of the text is to indicate the range of possbilities for structuration available on this level (just the combination of Autiot). It will go on to describe specific "combinations" of formative energies in effect as the Three self-generate from duality and expand into the higher-order stuctures of the Seven and the Twelve. But the usual assumption (that the text is just abbreviating and needs to be expanded) misses the stated meaning of the text: Aleph (consciousness) with everything, Bayt (physical supports) with everything, and the basic duality of the Sepher Yetsira. Having expanded to near infinite possbility only through the agency of combinations of the twenty-two letters, the text immediately unifies this multiplicity in the One Name and the single body. Suares dispenses with the "one and "he" of Kaplan's and Hayman's translations, leaving one free to contemplate the process itself, without an intermediary, and suggests a "return" similar to the one in 1:8 where we are told return to the place where it is said: lives run and come back. This "place" is where all words and all formation is found to be coming from "One Name," and "the proof" is the Autiot themselves, plural elements connected and communicating in a singular body. But what is the "One Name?" We have seen that the text is ambiguous as to God's exact role in things, and that the [God-Names] we are given in the text are both formulaic and variable. There are several important things the Sepher Yetsira, for all its completeness, does not tell us: the locations of the Holy Palace and the Holy Abode, the exact identity of the unique, true king and singular master, and the name of the One Name. The only name it does tell us (aside from God-Names) is the "great" Name that seals the six extremities, YHWH, and even then, only by implication. We are not told who is doing the sealing, just that the letters of his great Name are used, in the six permutations of three letters (Yod-Hay-Waw) three at a time. In Chapter 2, we are given the inner view of the same process, and the six seals of Aleph-Mem-Sheen, in the same order, so we have Yod=Aleph, Hay=Mem, Waw=Sheen. Read formatively, the meaning of these transformations is clear  10/Yod is 1/Aleph in existence, 40/Mem is the biosphere for 5/Hay, and 300/Sheen is the "Breath of God" and cosmic expression of the union/fertization of 6/Waw. In order, they would be Aleph-Hay-Waw-Yod-Mem-Sheen as Aleph projects (Waw) life (Hay) into organic (Mem) existence (Yod) and resurrects as Sheen. The second Hay of Yod-Hay-Waw-Hay (being identical to the first Hay) cannot be used for permutations; the outer extremities are sealed with the first Hay of YHWH, except for the Fifth (5/Life) Sephirot, which is sealed twice by YHW (because it's the "hinge" or gateway to the inner life of the First Four). The outer seals are given first because they establish the outer existence of the first life in YHWH. The inner seals are second because they form the inner life, with the second Hay of YHWH, and the inner breath of AMSheen-Yod-Noun, pervading (300/Sheen) the existence (10/Yod) of all existential life (50/Noun). The seals define 3-axis directions from both objective (height) and subjective (upper) perspectives, once for the outer life of the first Hay of YHWH and once for the inner life of the second. The dual perspectives make it clear that it is man's (outer) experiential space that is being constructed, as an objective and subjective being (what is "above" God?). The Seals are necessary because the axes are one-way flows of infinite multi-dimensional energy, except for 40/Mem, the 5/Hay/Life axis, which is the minimum energy of spacetime itself, between the archetypal beyond spacetime 1/Aleph and the cosmic both-in-and-beyond spacetime 300/Sheen. The seals stamp out boundaries (see the Tav/cosmic resistance of Hhatam) for a local universe in the multiversal waveform. They do this by establishing the three dualities (of the six permutations) of YHWH in the "depths" of each direction. The one-way flows are "sealed" with complementary permutations of one Name  each axis is defined by the components of the other axes. Later Kabbalah will screw this up and lose the significance of the three axes of 10/Yod/Existence, 5/Hay/Life and 6/Waw/Union, and the complementarity built into the Seals. The seals are necessary because they define (establish, stamp) a duality at each "end" of three one-way infinite flows of energy, which is both the energy of the flow and the energies of the other two, mirrored. This complementary duality, where energy flows in opposite directions, is, as we have seen, leveraged through the directions (subjective/objective), the logical Contrary Qualities of the Seven Doubles, and their pointed and unpointed homes in the zodiac. One becomes three in four steps (the final Sheen of Aleph-Mem-Sheen is achieved at the Fourth Sephirot of resistance (4/Dallet) in the depths of Evil); a double three (YHW/AMSh) double to become six and define a hidden, unsealed seventh; the seven cleverly use duality to turn into twelve. And all is united in the great Name. SY 1:10 Two: Rouahh Merouahh, Hhaqaq Vehhatsav (legislates or organises and chisels or cuts with). Twenty-two Autiot Yassod, three fundamentals and seven doubles and twelve simples and Rouahh One with (in) them. We are now in the First Four Sephirot, and the inner, timeless and non-experiential, space of Adam Qadmon, where interior human consciousness is formed. We have moved from the unifications of the Twelve, Seven and Three into One faithful king, through the unifications of the Twenty-two Autiot into One Name and a single body, and of all that is formed into One Name, and the Seals of the outer directions in his great Name. Here, at the Second Sephira, of 2/Bayt/Containment, the Autiot themselves are formed, as reverse impressions (sound familiar?) of the infinite, uncontainable, energy of 1/Aleph and the First Sephira/Keter. This is first appearance of Hhaqaq, engrave, since Wisdom engraved Shem with Thirty-two Intermediares back in 1:1. The text will now use its favorite verb of creation/formation ten times, at all the levels of expansion, through the rest of the first four Sephirot, the action of the Three Mothers in chapters 2 and 3, the formation of the doubles/planets in chapter 4, and the signs of the zodiac in Chapter 5. Logically, there is no engraving in the description of the First Sephirot. The Second Sephira is the source of the Three, Seven and Twelve, and the twenty-two elements in a single body, which will be used to construct everything else. Two: Rouahh Merouahh, Breath from Breath, two Breaths, one from above and one from below, the Breath from below "engraves" its response to the Breath from above, in the "signs" (aut) of the Autiot. The Second Sephira is Wisdom, Hhokmah, because the signs are what they mean. And the two Breaths are One Breath with(in) them. 1:9 [�10] Ten Sefirot of Nothingness: One is the Breath of the Living God, blessed and benedicted be the Name of the Life of worlds. Voice, Breath and Speech. This is the Holy Breath (Ruach HaKodesh). SY 1:9 Ten Sephirot Belimah. One: Rouahh Elohim Hhaim, blessed and glorified his Name belonging to the life of worlds (space-time). Qol (voice) Ve-Rouahh (breath) Ve-Dabor (word) and it is Rouahh Haqadosch (the saint). The four verses 1:9-12 describe the qualities of the first four Sephirot individually, while the text sums up the outer/lower six in one verse (1:13). The enumeration of the Sephirot begins with 1:9: One: Rouahh, One Breath. Breath is used twenty-one times in Kaplan's Short version and Sheen is the twenty-first letter of the alphabet. The Sepher Yetsira begins: BeShlashim-WeStaim Nativot-Playliot  By thirty-two wondrous paths. The identity of these thirty-two paths has been the subject of endless speculation, with the usual interpretation being the adding of the ten Sephirot and the twenty-two letters. This is also one source for the usual idea that the text is about "numbers and letters." That is true, as far as it goes, but it would be better to recognize that the numbers have letters and the letters have numbers. The obviousness of 10+22 seems to have stopped everyone (before or after Suares) from making the connection between the beginning of the text By thirty-two wondrous paths and the beginning of the description of the Sephirot: One: Rouahh Elohim Hhaim Two: Rouahh Merouahh Three: Mayim Merouahh Four: Esh Memaim which just happen to have thirty-two letters. and unity is restored in Aleph-Yod-Sheen, Iysch, Man, in the waters of Mem-Mem-Mem. the combinations of planets and signs. These are all non-random permutations designed to move logically from a small set of abstract, unstructured energies (the first four Sephirot) through increasing levels of structuration as the One Breath expands through the Three, Seven and Twelve. Here, at the beginning, the Thirty-two Paths are unified in the "Name of the Life of worlds" which is the Holy Breath, or Breath of the saint, Rouahh Elohim Hhaim, the One Breath, and it is the source of all creation and formation. SY 1:5 Their measure without end. Depth of beginning. Depth of end. Depth of Tov. Depth of Raa. Depth of above. Depth of below. Depth of East. Depth of West. Depth of North. Depth of South. Adon Yahhid true King (or eternal) has dominion over the Universe of (the) Holy Abode. Eternity of eternity immemorial.